A Book from the Sky (1987-1991) is the common name of an installation made by the Chinese artist Xu Bing. The installation consisted of hand-printed books and scrolls printed from blocks inscribed with 'false' Chinese characters. The installation was at the China Art Gallery, Beijing, China. The installation took Xu Bing over four years to complete, A Book from The Sky is comprised of printed volumes and scrolls containing four thousand 'false' Chinese characters invented by the artist and then painstakingly hand-cut onto wooden printing blocks. Below is one of the blocks carved by Xu Bing for this project. 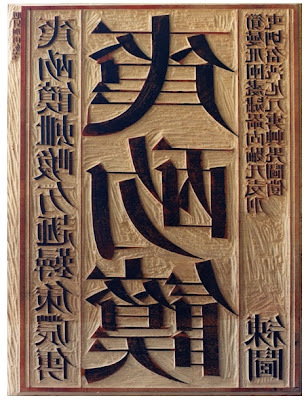 By definition wood block carving is a study in negative space - it is the space that is NOT removed that delivers the ink (and in this case the whole installation generates a negative space of characters that do not really exist as characters).